The National Association of Schools of Art and Design (NASAD) is an association of approximately 323 schools of art and design, primarily at the collegiate level, but also including postsecondary non-degree-granting schools for the visual arts disciplines. It is the national accrediting agency for art and design and art and design-related disciplines. The Association also provides information to the public. It produces statistical research, provides professional development for leaders of art and design schools, and engages in policy analysis. he Association's main role is that of a specialized, professional accrediting agency. A​c​c​r​e​d​i​t​a​t​i​o​n is the process whereby an association or agency recognizes an institution as having met certain qualifications or standards. In NASAD, the process focuses upon two principal concerns: educational quality and institutional probity. The review of educational quality is made according to nationally recognized standards developed by the Association with the full participation of its member institutions and in consultation with various professional groups in the field of art and design. The review of probity is made by determining whether the institution is indeed providing the educational services it says it is offering to the public, and whether its own stated operational procedures are being followed. 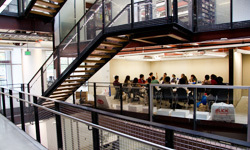 Set standards for postsecondary interior design education. Establishing and periodically updating standards for interior design education is one of CIDAs core responsibilities. A broad constituency supports CIDAs work to set standards for education and evaluate interior design programs. CIDA brings together representatives from professional organizations, testing, higher education, manufacturing, publishing and others with an interest in the professions growing body of knowledge. Evaluate and accredit college and university interior design programs. Using internationally recognized educational standards, CIDA employs a thorough three-step process to review and evaluate programs seeking accreditation. Facilitate outreach and collaboration with all stakeholders in the interior design community. Consistent and continual communication with all relevant stakeholders in the interior design community guides CIDAs outreach efforts and actions, which employ brainstorming, teamwork and consensus-building to address issues and concerns.